So that interpretation is based on the official design? Interesting to see an Internet address on a coin. ANother surprise is the use of English, not only because it is a foreign language, but also because it is more and more often the second language of the Flemish, but not of the Walloons. Wouldn't this have been a good opportunity to use Latin again? I like the design. And putting the country name in 3 languages is also as expected in a country that lives with the difficult balance between 3 communities. But indeed, as Figleaf stated, the use of English is really not done. We use Latin, as it is a neutral (and dead) language. 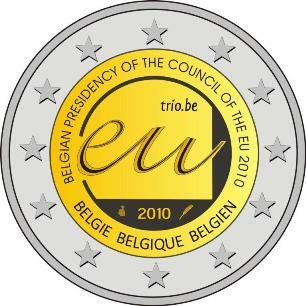 So, it's better to put, as on the 5 ecu of 1993, the words COMMUNITATUM EUROPAEARUM PRAESES. Actually Belgium has done both - Latin was used on many coins (e.g. €2 2007), but so was English (€2 2008). To a lesser extent, yes, but more frequently in the past couple of years. This year's Tervuren collector coin has the inscription "Royal Museum for Central Africa", in English. And I think there will be a railway coin later this year which will say "175 years Railways in Belgium". Voilà - the "official" design. This image is from the European Commission's website.